Santorini is a small, circular archipelago of volcanic islands located in the southern Aegean Sea, about 200 km south-east from Greece's mainland. 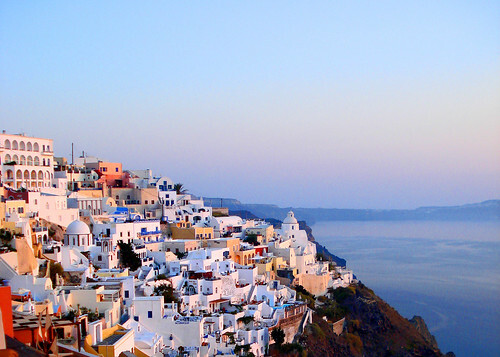 It is also known as Thera (or Thira), forming the southernmost member of the Cyclades group of islands. Santorini is essentially what remains of an enormous volcanic explosion, destroying the earliest settlements thereon and leading to the creation of the current geological caldera. Its spectacular physical beauty, along with a dynamic nightlife, have made the island one of Europe's top tourist hotspots. A giant central lagoon, more or less rectangular, and measuring about 12 km by 7 km (8 mi by 4 mi), is surrounded by 300 m (984 ft) high steep cliffs on three sides. The island slopes downward from the cliffs to the surrounding Aegean Sea. On the fourth side, the lagoon is separated from the sea by another much smaller island called Therasia; the lagoon merges with the sea in two places, in the northwest and southwest. The water in the centre of the lagoon is nearly 400 m (1,300 ft) deep, thus making it a safe harbour for all kinds of shipping. The island's harbours are all in the lagoon and there are no ports on the outer perimeter of the island, and the capital, Fira, clings to the top of the cliff looking down on the lagoon. It is the most active volcanic centre in the South Aegean Volcanic Arc, though what remains today is largely a water-filled caldera. The name Santorini was given it by the Latin empire in the thirteenth century, and is a reference to Saint Irene. Before then it was named Kallistē, Strongylē, or Thera. The island is the site of one of the largest volcanic eruptions in recent prehistory: the Minoan eruption, which occurred some 3,500 years ago at the height of the Minoan civilization. The eruption left a large caldera surrounded by volcanic ash deposits hundreds of feet deep and, according to a theory, may have led indirectly to the collapse of the Minoan civilization on the island of Crete, 110 km (70 mi) to the south, through the creation of a gigantic tsunami. Another popular theory holds that the Thera eruption is the source of the legend of Atlantis. It seems that this is my best shot so far!! At the moment it has the most favourites(210), the most views(5930) and it ranks 1st in interrestigness! !